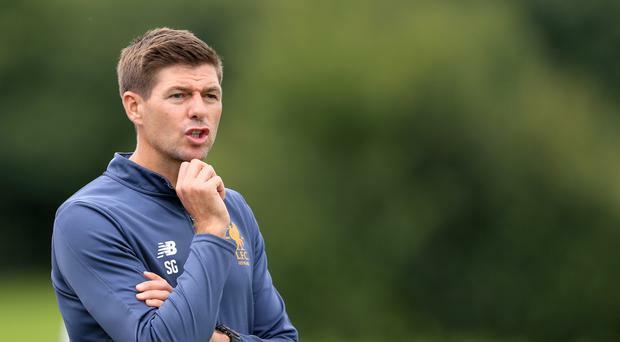 Steven Gerrard is currently in charge of Liverpool's U18 team. Liverpool legend Steven Gerrard is now the odds-on favourite to become the manager of Rangers. The LFC U18 coach's odds had tumbled on Monday evening and took another hit 24 hours later when Gers chairman Dave King was seen at Liverpool's 5-2 Champions League semi-final first-leg victory over Roma. The South-African based Scot was picked up by TV cameras celebrating one of Liverpool's goals, seated not far from club legends Ian Rush and Kenny Dalglish. The 37 year-old is now rated at 4/7 to be in the role at the start of next season by SkyBet, way ahead of joint second-favourites Alex Neil, Graham Potter and Neil Warnock at 6/1. Gerrard took charge of Liverpool's Under 18s a year ago after reportedly turning down the chance to manage MK Dons. His side sit second in the U18 Premier League table, behind only Manchester United in the table. He also managed the Liverpool U19 team who reached the quarter-finals of the UEFA Youth League, ousting United before losing to Manchester City. Joint second-favourite Graham Potter is currently in charge of Ostersunds, who beat Arsenal 2-1 at the Emirates in February but lost to the London club on aggregate in the Europa League. Neil Warnock is manager of Cardiff City, who sit second in the Championship table while Alex Neil's Preston are 9th in the table. The current Rangers boss is Graeme Murty but his odds to remain in charge for the start of next season are out at 25/1, behind Northern Ireland boss Michael O'Neill at 22/1.